Conductor is architecture-agnostic and does not try to force any design decisions on the developer. We here at BlueLine Labs tend to use either MVP or MVVM, but it would work equally well with standard MVC or whatever else you want to throw at it. 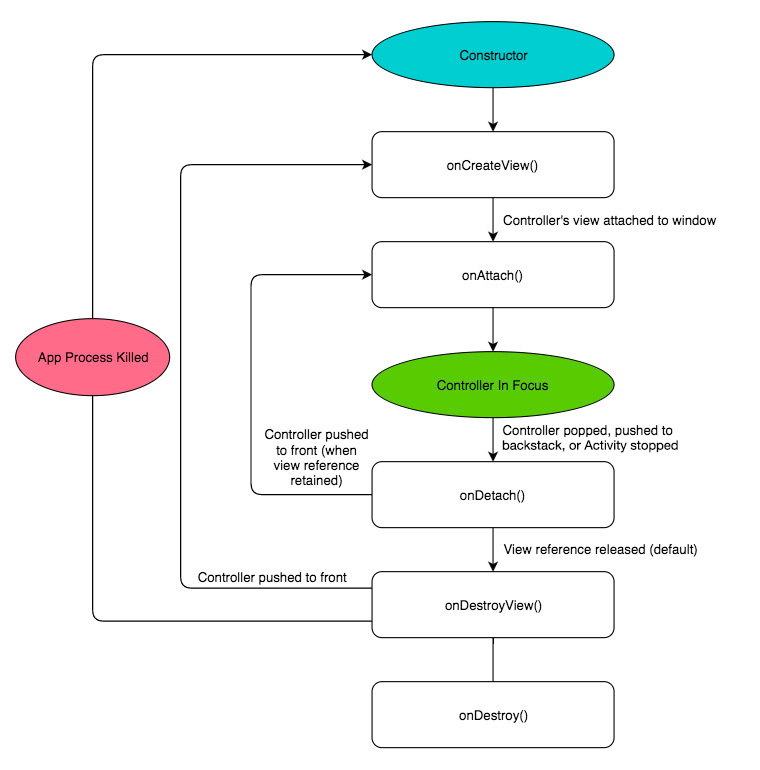 Controller The Controller is the View wrapper that will give you all of your lifecycle management features. Think of it as a lighter-weight and more predictable Fragment alternative with an easier to manage lifecycle. Router A Router implements navigation and backstack handling for Controllers. Router objects are attached to Activity/containing ViewGroup pairs. Routers do not directly render or push Views to the container ViewGroup, but instead defer this responsibility to the ControllerChangeHandler specified in a given transaction. ControllerChangeHandler ControllerChangeHandlers are responsible for swapping the View for one Controller to the View of another. They can be useful for performing animations and transitions between Controllers. Several default ControllerChangeHandlers are included. ControllerTransaction Transactions are used to define data about adding Controllers. RouterControllerTransactions are used to push a Controller to a Router with specified ControllerChangeHandlers, while ChildControllerTransactions are used to add child Controllers. Demo app - Shows how to use all basic and most advanced functions of Conductor. setRetainViewMode can be called on a Controller with one of two values: RELEASE_DETACH, which will release the Controller's view as soon as it is detached from the screen (saves memory), or RETAIN_DETACH, which will ensure that a Controller holds on to its view, even if it's not currently shown on the screen (good for views that are expensive to re-create). ControllerChangeHandler can be subclassed in order to perform different functions when changing between two Controllers. Two convenience ControllerChangeHandler subclasses are included to cover most basic needs: AnimatorChangeHandler, which will use an Animator object to transition between two views, and TransitionChangeHandler, which will use Lollipop's Transition framework for transitioning between views. getChildRouter can be called on a Controller in order to get a nested Router into which child Controllers can be pushed. This enables creating advanced layouts, such as Master/Detail. If the AutoDispose dependency has been added, there is a ControllerScopeProvider available that can be used along with the standard AutoDispose library. Copyright 2016 BlueLine Labs, Inc.